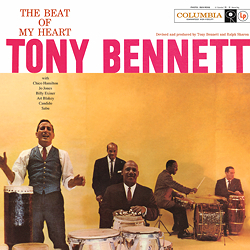 "The Beat Of My Heart" - Tony Bennett (voc); Ralph Sharon (p, arr, cond); Kai Winding (tb); Al Cohn (ts); Nat Adderley (tp); Herbie Mann (fl); John Pisano (g); James Bond, Eddie Safranski (b); Eddie Costa (vib); Jo Jones, Chico Hamilton, Art Blakey (dr); Sabu (dr, perc); a.o. ﻿The crooner Tony Bennett fulfilled a lifetime dream with this percussion jazz formation: at last he could go into the studio with the greatest drummers and top-notch jazz musicians and just swing to his heart’s content. Chico Hamilton, Jo Jones, Art Blakey, Candido and Sabu were responsible for the beat while Kai Winding, Herbie Mann, Nat Adderley and Al Cohn took care of the background amongst other things, and such great musicians as Milt Hinton and Eddie Safranski and John Pisano tied the whole thing together. The twelve numbers, recorded in four sessions, were arranged by pianist Ralph Sharon in a laid-back and diversified manner and allowed Tony Bennett plenty of room to swing along serenely. Should one recommend a particular title? If the answer is yes, then the 'pure' numbers with Chico Hamilton. And the rest? Yes, the good old jazz evergreens – which, however, sound quite new here. Really one could practically recommend all of them! To be sure: this is no LP for narrow-minded jazz purists, and certainly not for lovers of the soothing crooner – but why not one for both camps?